The need to have local Zimbabwean content on the internet has been widely discussed. The main idea being that the internet will become more relevant to locals if it has content people have traditionally consumed on platforms like TV, radio, newspapers, books and so forth. The capacity of our local ICT infrastructure to enable the creation and hosting of this information locally has also grown over the years. There are more people using the internet too, especially with the introduction of mobile broadband by a number of operators locally. The Zimbabwe Internet Service Providers Association (ZISPA), whose task it is to manage the .co.zw space, have a website they don’t update so you can’t really rely on it for current information and procedures. TelOne, the organization in charge of the .org.zw space also doesn’t have registration information easily accessible. If you do decide to check the domain registration procedure page on the ZISPA site, it has information that non-tech people cannot understand (“DNS servers” and such other terms) and therefore excludes a lot of people. For help with the procedure, people then have to go to ZISPA members, the ISPs. Now, the membership list on the ZISPA site was last updated on 9 August 2007 and some of the ISPs listed there don’t exist anymore, so even that route won’t yield straightforward answers. We have received several complaints by technology professionals and other people who just want the process to be easier. Most have resorted to registering international domains (.com ones that is) after having giving up on what they find to be needless procedures demanded by the ‘system’. We have held an interview with the current ZISPA chairman, Troy Prinsloo, and will post extracts from the interview here in the coming days. He generally acknowledges some of the problems with the current setup and explains how some of the issues (especially those associated with the delays in getting a domain registered) are unavoidable. Yesterday, we decided to play customer and call some of the well known local ISPs to request domain registration services. We called 9 of them. All but 2 (Webdev and ZARnet) won’t let you register a domain without you buying another service from them. The service can be anything from a dialup account, a broadband account or web hosting account. We didn’t check with all ISPs in Zimbabwe but the ones we called are the most known and we believe are representative of the prevailing environment. Clearly, a lot can be done to improve the process and make it as available and transparent as possible. ZISPA can start with updating its website and providing information that makes it easier for non-techies and techies to register domains. More players should also come in with some innovative solutions to make the process faster, easier and even cheaper. We would like to know what your experience has been registering a domain in Zimbabwe. Please share in the comments below. Has anyone else got the same kind of response when you call Telco. It seems no one is sure about what they are doing at that company. The last time I called inquiring about SIP lines, I was transfered 4 times until I decided to cut the phone. 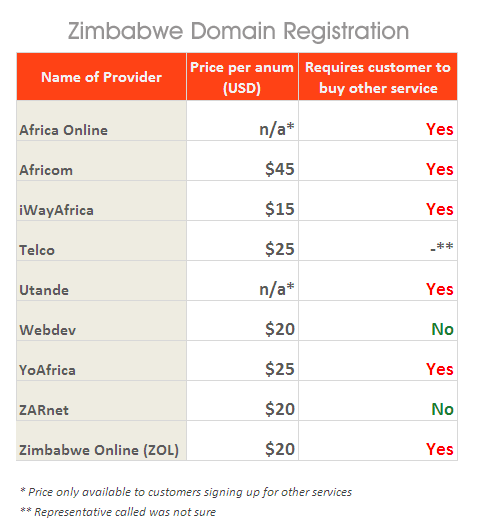 Spot on techzim, for thoz reasons, i ended up registering .com domains! While Zimbos r always keen on shifting the blame on politics, i think its cases like these that make it clear that politics aside, we r still a failure. In SA i can register and activate a domain online in 10mins! Spot on TechZim! I have never agreed with you more on this. The ZISPA website, http://www.co.zw, is out of date. Mind you this was the brainchild of ZOL and partners. What does it say about this ISP? The guy who manages the zispa registration email never gets back to you or is said to be on leave because he does this part-time. So the only way to register is through the same ISP’s who manage ZISPA. I say ZISPA should not be controlled by these greedy ISP’s. It’s just common sense. The blame for this falls squarely on ZOL. Please respond. The ISP’s or their greedy employees will try and make it very difficult to register a domain the legal way. The argument here is not about stringent requirements coming from Potraz. It is about how slow ZISPA is at helping registrants setup a domain. This is because ZISPA members have a vested interested to squeeze as much bucks from you by channeling you to their ISP’s for a $20 fee for registration. This is because of a need to profiteer. In effect the organisation is failing to fulfil it’s mandate and Potraz should consider taking control away from them and placing it in a neutral party. Then automation of the services will go a long way to help improve service. It will stop greedy and lazy employees from disrupting the flow of business. And if half the time the domain registrar fails to send in the correct information, it might be because you are not communicating effectively. The ZISPA website is out of date, there are no correct contact details except for the email address fo which it takes a decade to get a response from because the guy is away on holiday jet-skiing in the Bahamas. My point still stands, ZISPA needs to communicate and process manage better. The nameserver box moves around from ISP to ISP on rotation. Then there is only one individual who does registrations. It took me 7days to have one domain registered because the dude was on a skiing holiday. How much is the registration if one submits application directly to ZIPSA? Painful reality, we need to jack up. Put young Turks in all IT related environs. I think the major problem is that we have capital lieing with the sunset generation. They simply don’t have a clue on the needs of this sector. Huewei employs young guys……average company age is in the 30’s and look at the results. I think the solution is simply to register a *.zw.com domain or some thing of that sort e.g. *.zw.org domains. Not only are the *.zw domains expensive transferring that domain will take you decades, adding subdomains is not easy. You only need to look at the ZISPA logo to learn all you need to know. There was a time when people went on a domain registration spree. Registering and parking many domains. I believe it was for speculative processes. These people made ISPs (perhaps as a consequence of a ZISPA members’ agreement) demand more from a potential registrant, making it a very slow processs. It spoilt everything for many people who legitimately wanted to register domains for business or websites. Consequently, I am NOT for an automated process, though I would appreciate a faster registration process. A day would be good enough for me. lot of people.”…ZIPSA deals with the ISPs that are members of the association, not with individuals. So if you do not understand it, then you are probably the wrong person seeking service from the wrong place. I do know that they have special provision for those registering from without but all registrations are done through the ISP. So continue dealing with those expensive ISPs for your registrations and hosting services. I agree in part: if you do not know what ‘DNS’ is – you probably shouldn’t be registering a domain & it would be best for everyone involved if an ISP register it for you. I disagree on automation: i think automation would be a fine idea: as long as they have a clear dispute resolution process. Tinm@n you took the words right off my fingers. There was a registration spree that prompted all of ZISPA’s partners to then update the ownership requirements. Imagine a John Doe registering cocacola.co.zw and then auctioning it to Delta at a future time? It is necessary to protect all legal entities that is why some checks and requirements need to be met first before the registration goes through. Automation should not be considered for that simple eventuality. These guys should be serious or either leave their posts and allow other who are serious to do the job!! Improvements do need to be made, but lets point the finger to where the Improvements must be made. Most of the issues that we are bringing up above here are ISP and Domain Registrar errors, problems, costs and just failure to follow the POTRAZ required registration process. – Maybe as a way of testing this the Techzim team can do an under-cover live run to setup a domain and see where the system is REALLY failing – but from both the Registrar’s side and the ZISPA register side. And as for the look of the site and any other asthetics a.k.a pretty graphics and such dont make a for a better system, ask any Linux/UNIX admin. What system are you talking about? It is not any sort of system failure that is being discussed, but the bureaucratic process of establishing/registering a domain. You must be joking ! Try register a car, a birth, a death, a marriage, a sim card, a company, Zesa bill, whateva ….. without ID ????. DO you even know what a domain is ?? Zimbabwe’s TLD is trusted and we should be proud of that. Those who cry for freedom are usually the ones who want to abuse it. A good website takes weeks to develope – so what’s two days ?? Eiish !!! cost is subject to much argument. most of these ISPs have very low business so, like the banking industry, maximise by charging very high figures. (globally, the average annual registration cost is $10 for everything and lots of bells and whistles). some would argue that the high charge is responsible for the low business…chicken or egg, your choice. i believe they should bring down the cost and improve their offerings. the economy isnt too good for this business. so in some way, i do sympathise with them. if, by “that organisation”, you mean ZISPA, bear in mind that ISPs make up that organisation. policy is determined by them, by consensus unless, otherwise, it is by law…which becomes a POTRAZ issue. as for registration requirements, I am in full support of those requirements. we dont want the massive registrations that took place at some point, many of which were foreign owned and, worst of all, speculative! ha ha! And every else it’s instant. Register even for a .co.za domain and you get it instantly. What a joke. Yes very funny, Try register vodacomsucks.co.za or zumatherapist.co.za and it won’t last 10 seconds ha ha ! to you….. Does anyone know where the ZISPA offices are?